Officially, only the L/48-armed vehicle was named Jagdpanzer IV. The L/70-armed vehicle was named Panzer IV/70. This unit, called the Panzer IV/70 (V) (Sd.Kfz.162/1) was one of two variants armed with the same Pak 42 L/70 gun. The (V) stands for the designer, Vomag. The Vomag design used a modified chassis permitting a very low silhouette, mounting the superstructure onto the original Panzer IV chassis required additional vertical steel plates mounted onto the chassis to counter height differences. Terrible AI values, defense no better than a Panzer IV, and no ER, at 25 points… The guns are slightly better than a Panzer IV, but the Panzer IV is probably the better choice. This unit is a true tank hunter. 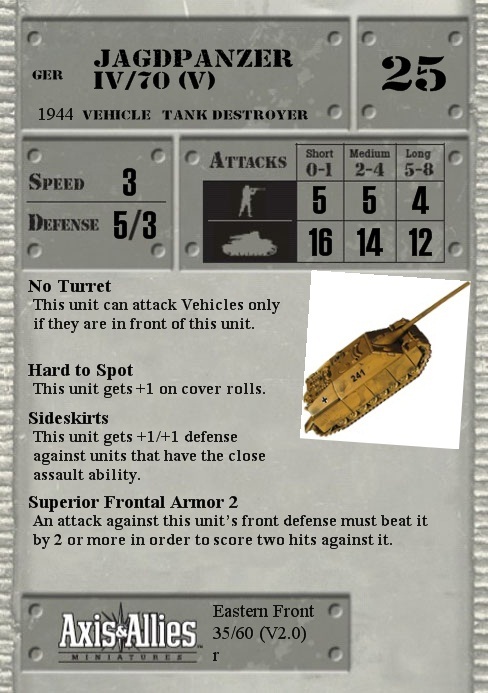 Because of Superior frontal armor 2, all similarly priced allies tank will have a hard time hitting it from the front at medium or long range while it can retaliate quite easily. Sideskirt is nice against most Infantry units. I don't think that this unit is a bad deal, but with so many options in the German arsenal, there is a lot of good units in that point range. Like all Panzer IV based units, it is vulnerable to allied aircraft. When possible, leave it in cover to benefit from the Hard to Spot SA.